There has been some good progress in the last couple of weeks on Sandy Lane Halt. 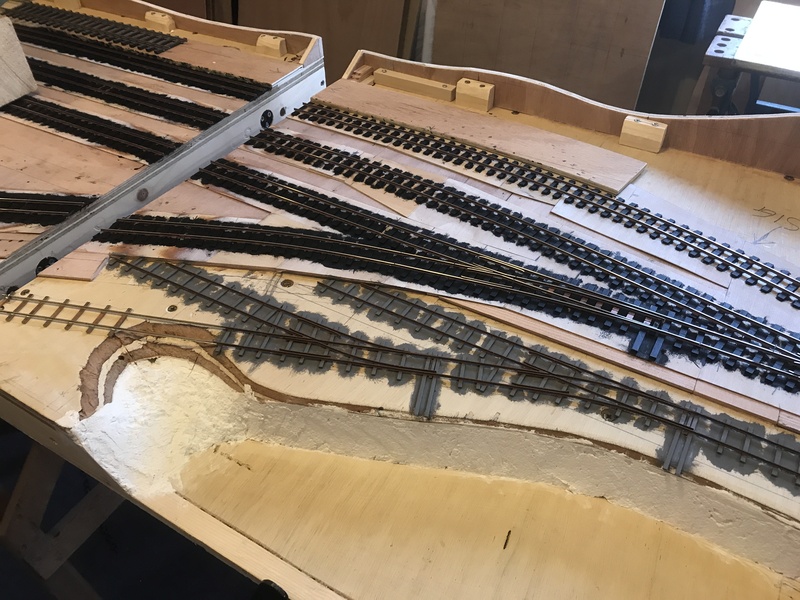 All of the track (bar one small area) has now been painted, though the sand quarry track work will need some further work to add more colour here we think, as the grey is a bit monotone. Some greens and browns will be added to break it up a bit, these should hopefully give the impression of decay and rot, and coupled with the very rusty rails complete the picture of being long abandoned. 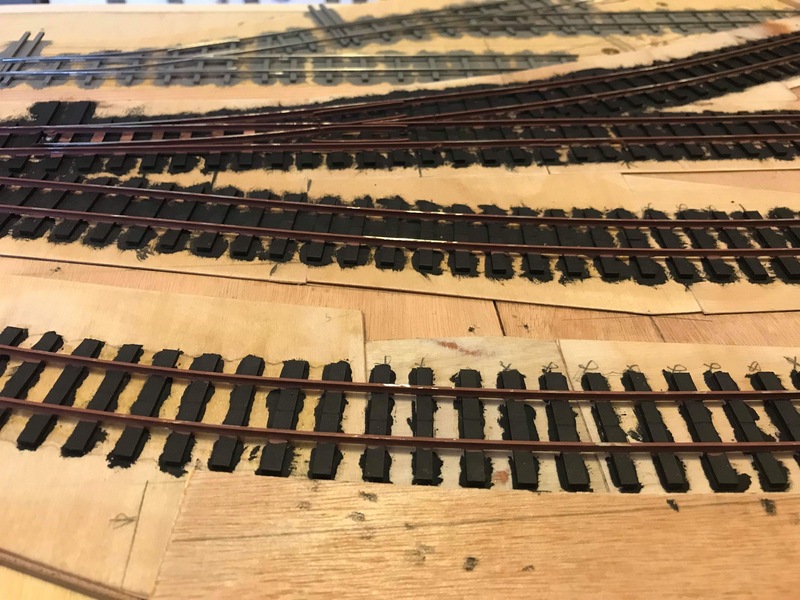 As we have reused two boards from the previous incarnation of Henmore, to provide consistency we’ve had to use the same colours for the main track, being Humbrol matt black (No.33) for the sleepers, and Humbrol matt rust (No.113) for the rails. 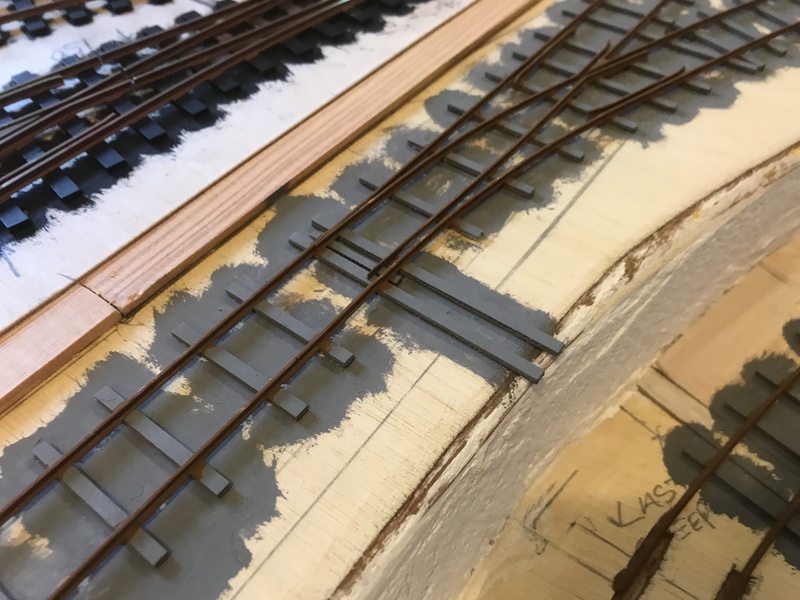 The sand quarry track has been painted with Precision Paints track colour (weathered sleepers) (No.P979) and track colour (rusty rails) (No.P977) – this has provided a nice contrast with the rest of the track. Most of this track will be buried under sand, weeds and a number of Silver Birch trees when we get to the scenic stage of the build. Close up view of the lightweight sand quarry track – the difference in the weight of the rail sections is noticeable in this photo, with HDLR track built from Code 100 rail, and the sand quarry from Code 75 rail. Using smaller sleepers too also helps. 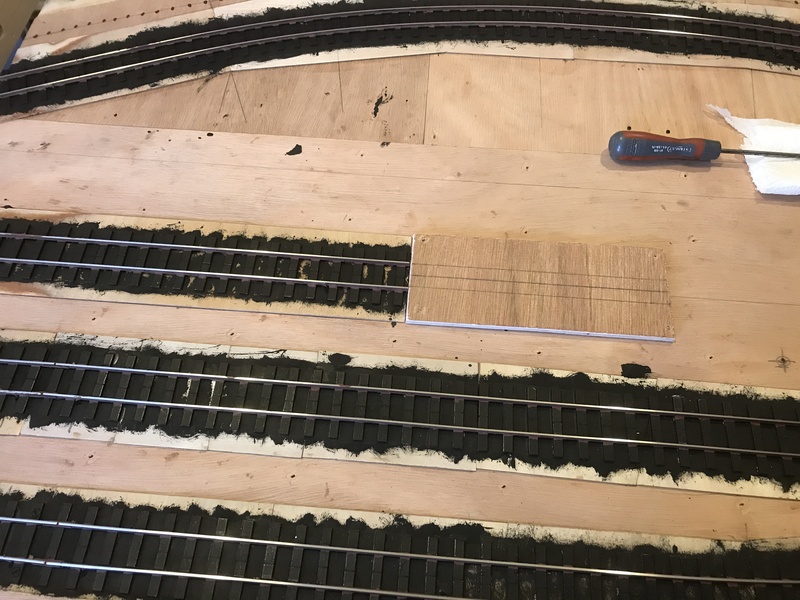 During my last visit to help Tim work on the layout, once we’d painted the sand quarry track, we began installing the base for the standard gauge track on the layout. Standard gauge on a narrow gauge layout I hear you cry, heresy! Don’t worry, its only short six inch section of it. If you’ve read the history of the Henmore Dale, you’ll know, that much like their nearby neighbour the Leek and Manifold, the Henmore Dale made extensive use of transporter wagons for carrying standard gauge wagons over its narrow gauge rails. This section of standard gauge sits at the end of the short siding in the station, and will hold one four-wheel wagon. It should really hold more than this, but we may have forgotten that there needed to be a signal to control the exit from the loop just past the end of this bit…a signal for which we’d already drilled a hole in the baseboard and couldn’t go anywhere else unfortunately! 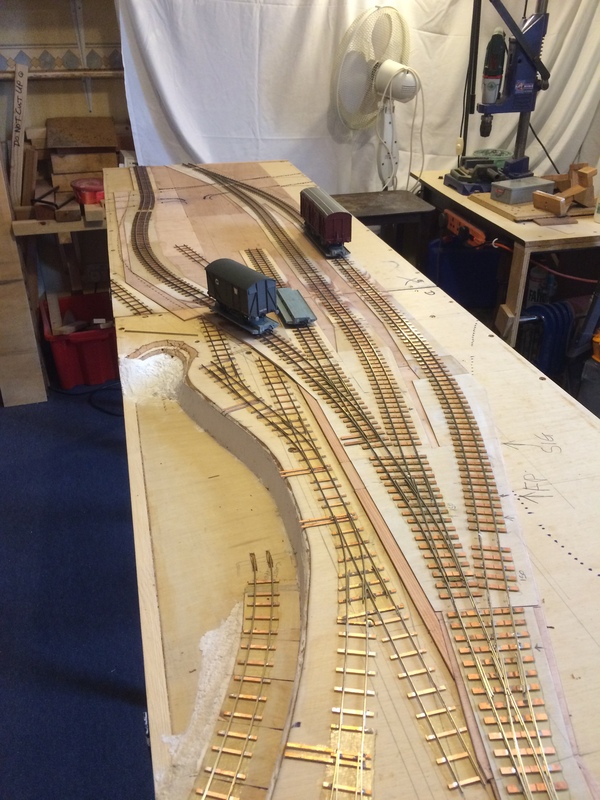 First layer of ply laid for the base of the standard gauge ‘siding’. The pre-drilled hole for the starting signal at the end of the loop can just be seen at the right side of the photo. The base for the standard gauge section is 3 layers of plywood, to bring it up to the right height to match the transporter wagons. In the early days of the layout construction you can see a number of them being used to test clearances. Not long after we’d laid all of the track, a test to ensure that the clearances were correct to allow the use of the transporter wagons. Once the track has been laid, sleepers will be added around the edge to contain the ballast and finish it off neatly.